Inventory We are a resale marketplace, not a box office or venue. Ticket prices may exceed face value. This site is not owned by Bell Auditorium . The Bell Auditorium is part of the Augusta Entertainment Complex including the Bell Auditorium. 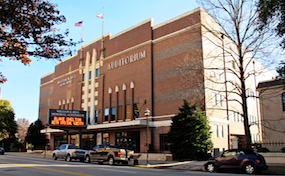 The Bell Auditorium box office is located at 712 Telfair Street in downtown Augusta, GA. Many of the bigger shows and concerts are played at the arena, however, smaller more intimate events are frequently scheduled for the theater. Bell Auditorium tickets have included performers like Dave Chappelle, Vince Gill, Maxwell, ZZ Top, and The Monkees. AuditoriumAugusta.com is not currently affiliated with any official website, box office, or primary supplier. We are an independently owned and operated company that concentrates in all online sales in the secondary ticket market. To order tickets to all Bell Auditorium Augusta events please follow the steps through checkout or call our operators at anytime.